I really wanted this one to be good! If you don't know who Pittsburgh Dad is check out a youtube example here. This is another beer made by Full Pint outside of Pittsburgh, and you can check out some info on them in another review here. Personally I think the videos are awesome and relate to more than just Pittsburgh, so check em out. They seem like really good guys and always are on local radio shows and do appearances around town. 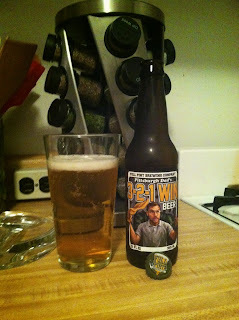 Any who, this is Pittsburgh Dad's 3-2-1 Win Beer. It's named after Pittsburgh Dad's quote to when watching a the Pens or Steelers to countdown the last seconds of a game. Although he uses it for Pens more than Steelers. Sad to say I was pretty disappointed. It's a pilsner and super clear and crisp, but that about all. Just kinda tastes like beer, which isn't bad, beer is great, but I was hoping for something a little more flavorful. But hey if its marketed to the local clientele this one flies off the shelves. The pour is nice, small frothy head, and a grassy smell which lends the style. And drinkable, so I don't wanna be too harsh, its a pilsner and tastes like a pilsner. I paid like 3 bucks for it, so its not breaking the bank, and I kick myself for not saving the bottle.